The U.S. bacterial conjunctivitis drugs market is exhaustively examined and analyzed in a recently published report by Persistence Market Research. The forecast period for this market research is 2012-2024; however, 2012 is take as the historical year and 2013 is considered as the base year for calculating market values. The first part of the report features market overview, followed by a section on key drivers and another section on key restraints. The key drivers section focuses on the factors that contribute to market growth, whereas the restraints section includes the factors that are responsible for the declining growth prospects. This report offers a study on the entire market analysis conducted for various antibacterial drug classes that are commonly prescribed for the treatment of bacterial conjunctivitis. The segmentation based on the drug class includes four key segments and the drugs that fall under respective classes. The report elaborates each of them, providing an in-depth data about their historic, current, and estimated status in the market along with the factors associated with their market condition. Apart from existing large companies involved in pharmaceutical commercialization, new entrants in the U.S. market can also grasp valuable insights from this report. The last section of the report constitutes the analysis of key players and offers an extensive overview of all the dominating companies competing in the U.S. market for bacterial conjunctivitis dugs. Most of them are increasingly seeking market expansion through strategic mergers and acquisitions. They are also striving for better, strengthened distribution network for enhanced operations across the U.S. market. The report also features a range of market trends and upcoming opportunities. To deduce the U.S. bacterial conjunctivitis drugs market size, the report considers various aspects based on secondary research. Furthermore, key data points such as region-wise split and market split by the drug class; and qualitative inputs from primary respondents have been incorporated to arrive at appropriate market estimates. The forecast presented in the report assesses the total revenue generated and expected revenue contribution in the U.S. bacterial conjunctivitis drugs market. The report begins with sizing the market in terms of value and volume for the base year, which forms the basis for forecasting how the market is anticipated to take shape in the near future. Given the characteristics of the market, gathered data is triangulated via different analysis based on supply side and demand side drivers and other key dynamics of the U.S. bacterial conjunctivitis drugs market. To develop the market forecast, Persistence Market Research has also conducted a factor analysis to understand the impact of various forces/factors on the target market. The report provides forecasts not only in terms of CAGR but also presents a detailed analysis based on key parameters such as Year-on-Year (Y-o-Y) growth to understand market predictability and to identify the right opportunities. Another key feature of this report is an analysis of the U.S. bacterial conjunctivitis drugs market and the corresponding revenue forecast in terms of absolute dollar opportunity, usually overlooked while forecasting the market. However, absolute dollar opportunity is critical in assessing the level of opportunity that a provider can look to achieve, as well as to identify potential resources from a sales perspective in the U.S. bacterial conjunctivitis drugs market. Further, to understand key segments in terms of their growth and overall U.S. bacterial conjunctivitis drugs market performance, Persistence Market Research has developed a market attractiveness index to help providers identify existing market opportunities in the U.S. bacterial conjunctivitis drugs market. Conjunctivitis, which is medically termed as inflammation of the membrane that covers the outermost layer of an eye, can be infective, allergic, or irritant-driven. However, infective conjunctivitis - especially bacterial, is the most commonly observed type among the three. The global bacterial conjunctivitis drugs market is highly uncertain and is foreseen to witness sluggish to declining growth in the near future. In 2013, the global market for bacterial conjunctivitis drugs recorded a value of US$ 473.3 Mn. The market is currently exhibiting a sluggish growth but is expected to witness a decline during the next few years and the revenues may drop down to US$ 439.8 Mn through to 2024. PMR estimates CAGR of 2.7% for 2012-2018; however it is likely to dwindle down to -3.73% during the next half of the forecast period i.e. 2018-2024. Recently, Healio (the U.S.) indicated that nearly 5 million people in the U.S. are inflicted by acute bacterial conjunctivitis, each year. Moreover, a recent survey published in the JAMA (Journal of the American Medical Association) states that over 50% of the conjunctivitis cases in the U.S. are of bacterial conjunctivitis. The aforementioned figures clarify that it is one of the most common eye problems affecting people of all ages across the U.S. Such higher prevalence of the disease definitely prompts at increasing demand for effective drugs against bacterial conjunctivitis. However, the market for bacterial conjunctivitis drugs is witnessing a declining growth and the revenues may continue to drop over the forecast period. Most of the major blockbuster drug patents are on the verge of expiring, which is the primary restraint to the market growth. Key blockbuster drugs that are due for expiry, include Moxeza, Besivance, Vigamox, and Zymaxid. Besides a challenge posed by the loss of exclusivity of patents, the market also faces a restrain due to dearth of novel compounds available for preclinical and clinical examination. Only a few investigations against bacterial conjunctivitis and drug approvals are currently in the pipeline. Moreover, following the drug expiry issue, physicians have been prescribing a wide range of affordable generic medications since the past few years. This is another important factor responsible for slumped bacterial conjunctivitis drugs market across the U.S. Physicians, ophthalmologists, and optometrists generally prescribe antibiotics in the form of medications, eye drops, or ointments. However people are aware of the fact that conjunctivitis is usually acute, self-limiting, and does not cause a serious health issue. Moreover, it can also be treated and cured on its own within a few days. Awareness about this may also detain the demand for bacterial conjunctivitis drugs in the market. 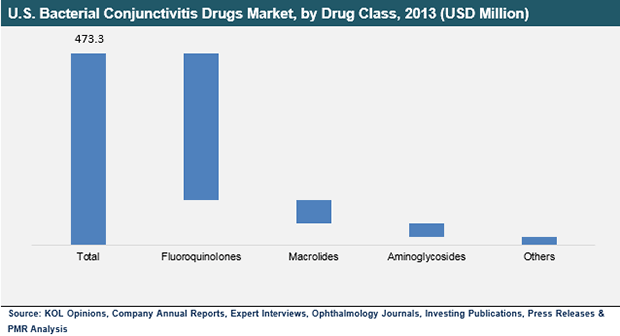 The U.S. bacterial conjunctivitis drugs market is segmented on the basis of drug class into four key segments. In the Fluoroquinolones class, there are six key sub-segments, including Ciprofloxacin, Ofloxacin, Levofloxacin, Moxifloxacin, Gatifloxacin, and Besifloxacin. In the class of Aminoglycosides, there are Tobramycin and Gentamycin. The Macrolides class also has two sub-segments i.e. Erythromycin and Azithromycin. In the ‘others’ segment, there are a few common drugs, such as bacitracin, ceftriaxone, and fusidic acid. Owing to higher efficacy and broad spectrum activity against conjunctivitis causing bacteria, Fluoroquinolones are the most widely recommended class of drugs. This segment registered over 70% share of the U.S. market in 2013. This class of drugs will however witness a heavy collapse in terms of sales and thereby a substantial drop in the CAGR over the forecast period. From 4.9% estimated over 2012-2018, the Fluoroquinolones segment is expected to take a downturn to a CAGR of -8.1% during 2018-2024. Vancomycin ophthalmic ointment is one of the medications that are currently in the clinical trial pipeline and a few more are pending for approval. The U.S. market for bacterial conjunctivitis drugs is highly fragmented and competitive. While the marketplace comprises existing as well as emerging small and large players, competition among them is intense despite the market is gradually approaching a debacle. Some of the prominent companies in the market include Bayer AG, Merck & Co., Inc., Pfizer, Inc., Novartis AG, Hoffman-La Roche, Ltd., Akorn, Inc., Actavis plc, Perrigo Company plc, Valeant Pharmaceuticals International, Inc., and Santen Pharmaceutical Co., Ltd.
Perrigo Company plc, Pfizer, Inc.